From the age of 6, Calan discovered the sport of motor racing, and immediately developed a keen passion and fascination with Formula 1. Through his own research, it didn’t take long for him to find out that the majority of successful racing drivers commenced their careers in karts. And so began a year of his parents looking into the sport, Calan doing his jobs around the house to save for his first helmet, and by the age of 7 he had bought all his gear, had his own kart, and was a proud member of Tiger Kart Club! Over the next 7 years, Calan developed his craft, initially dominating within the club level, before becoming one of the quickest and top performers in the state in the age groups he competed in up to the age of 13. Right from the start, kart shop owner Harvey Morrison took a keen interest in Calan, and provided hours of support to both he and his Dad to teach them the art of driving the kart, race craft and the important fundamentals of kart set up to achieve optimum performance. In the Cadet and Rookie classes, Calan achieved many successes, including winning the Club Championship at Tiger Kart Club 3 years in succession, coming 2nd and 3rd in the Western Cup Series, winning Open events and in 2013 was the Champion of one of the biggest events in the country, the “Carnival of Karts” at Cockburn International Raceway. That same year, he was also fortunate to be able to compete in large events on the east coast of Australia, the Victorian Open at Puckapunyal and the City of Melbourne Titles at Todd Road. With this solid grounding in place, 2014 was a year of rapid progression for Calan’s racing career. In consultation with Harvey Morrison, he and his family decided that there would be limited benefit in just stepping up to the regular Junior National class, and they decided to make the leap straight to the High Performance Junior Rotax class, where he would be regularly competing against 15 to 20 of some of the strongest performers in the country, the majority of whom were a year or two older. This was a fantastic experience for Calan, the racing was tough and he performed well often being one of the quickest on track. Junior Rotax during 2014 was a huge experience, developing racecraft skills to another level, and demanding precision driving. 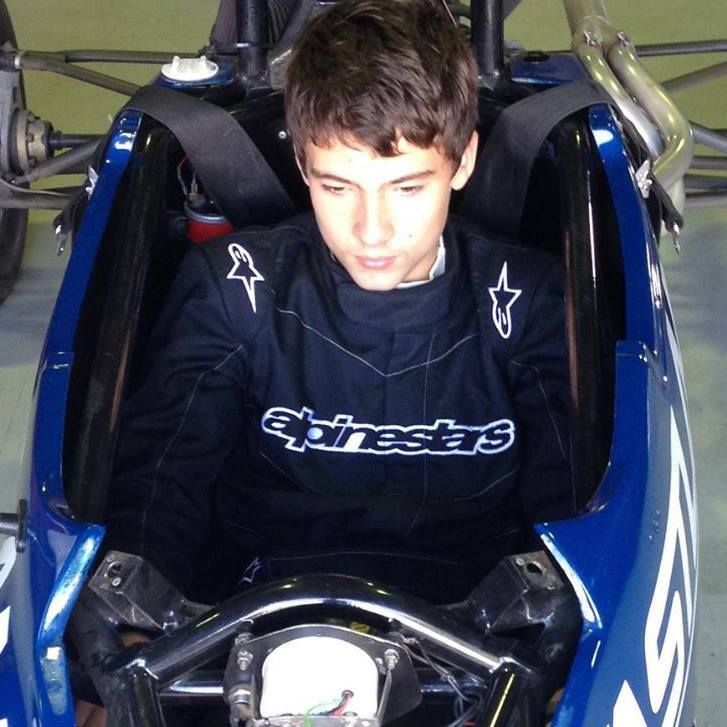 During late 2014, Calan took part in two test sessions in a Formula Ford, his first opportunity to drive a fully-fledged race car. The tests were very successful and Calan was offered an amazing opportunity with Western Australia’s premier Formula Ford team, “Fastlane Racing”, for 2015. As the first young participant in Fastlane Racing’s new Driver Development Program, Calan developed his skills in the car under the guidance of Brett Lupton and Peter Major. Brett has vast experience in Formula Ford, along with Formula 1 and Formula 3, and was responsible for training Daniel Ricciardo in his first steps moving from karts to cars. Peter Major is the current Western Australian Formula Ford Champion. For the first half of 2015, Calan was exposed to a great deal of track time with one on one driver training, simulator work, data analysis and a thorough fitness program. His lap times progressed extremely well, and from August of that year, the program turned to racing to compete in the final 3 rounds of the WA Formula Ford State Championship. 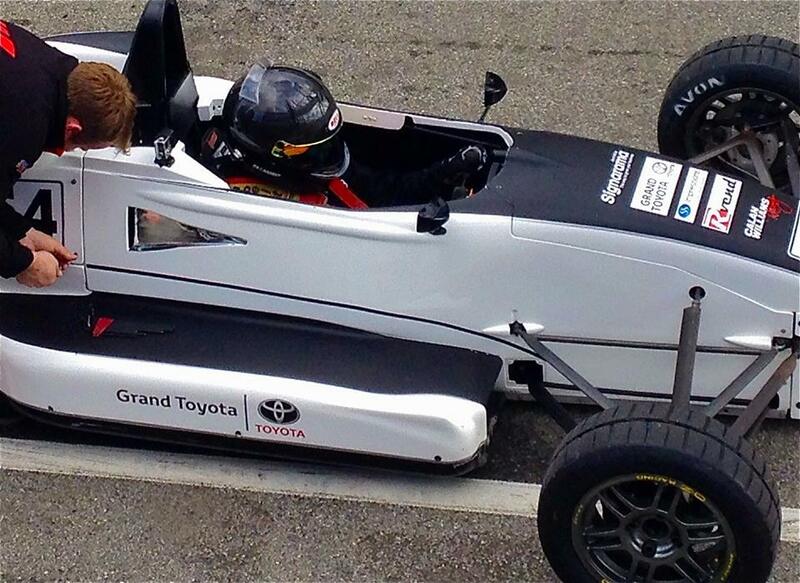 A Dream Start to Calan’s Car Racing Career! In a strong field of the regular State Championship contenders, Calan stunned the competition in the August Round by heading out to his first ever qualifying session and bringing the car home in P2 to qualify on the front row of the grid. Of the field of 18, a solid 4th after spinning the wheels excessively at the start (Calan’s first ever standing start in a race), followed by a 2nd place in Race 2 put him well in contention. A great start in the final race saw Calan and eventual Championship winner Oliver Baxter pull away from the field. Knowing exactly what he needed to do, Calan stayed there to finish the race in that position and win his first ever Formula Ford event with the most points for the day. An amazing feat for a 15 year old in a field of experienced drivers. In the September Round Calan was again in contention until a brake failure caused him to retire from the last race. In the final October Round for the year Calan took his first Pole Position by a commanding 3 tenths of a second, and then finished in his second podium position in only his first three events. The 2016 WA Formula Ford Championship was an even more impressive and exciting season for Calan. He was on pole position every round other than the first in which he had clutch issues, amongst a strong field of around 20 throughout the year. Some early misfortune with a red flag penalty and a broken gear stick forcing him to retire from the lead of one round saw him playing catch up across the season in the championship. An exciting finish with a narrow 2nd place was the result after 5 wins in a row to complete the season including 3 out of 3 wins in the final round. So the complete his competition in Formula Ford, Calan secured Pole Position at seven out of his ten meetings (including the last 6 in a row), won three meetings including his debut, secured two other podiums, smashed the lap record at Collie, and set the fastest lap in more than four years at Barbagallo Raceway. In addition to this he has set the fastest lap in almost half of his thirty races, won his last five races straight and as previously mentioned finished a solid second in the 2016 WA Formula Ford Championship. The Step to Australian Formula 3 – Champion in Debut Season! In December of 2016, Calan was invited by leading Australian Formula 3 team, Gilmour Racing, to get his first taste of a real “wings and slicks” race car and test their Mercedes powered Dallara F307 car. This was a real step up from Formula Ford with an increase in top speed, however more significantly an introduction to downforce allowing dramatically increased cornering speed capability. Within only a few laps, Calan had come to grips with the change and was posting competitive times at Queensland Raceway completing more than 70 laps on a day in which the temperatures hit at times in excess of 40 degrees! As preparation for the 2017 Formula 3 Championship, Gilmour Racing entered the 2017 “Open Wheel Festival” at Wakefield Park in NSW. Calan’s team mate for the event was Jon Collins, 2015 Australian F3 Champion. Calan stunned spectators at the event by only narrowly missing putting his car on Pole Position and then achieving 2nd in his first F3 event. Errol Gilmour subsequently made the decision to promote Calan to the team number 1 F311 car as their 2017 Championship contender. Following this, the team entered Calan in the “Ipswich Festival of Cars” as further practice prior to the championship. Calan qualified on Pole Position and dominated winning 4 races by huge margins. After such a comprehensive preparation, expectations were high of Calan for his debut in the Australian F3 Premier Series. His first day in the series must arguably be one of the best in the history of the Championship. Under intense pressure, Calan delivered by qualifying on pole position, winning his debut race in the series and claiming the new outright lap record at the Morgan Park Circuit in Queensland! Calan’s outright lap record of 1:07.94 is the quickest ever recorded by anyone in any car over the 50 years of the circuit’s operation. Calan followed up Round 1 in decisive fashion once again taking Pole Position, once again setting a lap record and winning 2 of the 3 races (2nd in the third) to win the round. The key for the round victory were two decisive moves to take the lead and win races 1 and 2. Race 1 Calan successfully set up his main rival John Magro for a switch back to the inside out of the hairpin onto the main back straight setting up a long drag race and outbraving manoeuvre into the tight turn 5. Race 2 Calan was again behind Magro early before making a dramatic move to pass him around the outside of the hairpin turn 3. On his first visit to the high speed Sydney Motorsport Park, Calan once again claimed a decisive Pole Position along with taking a convincing race 1 win. Race 2 provided a spectacle to the crowd with Calan demonstrating his ability to battle wheel to wheel with a race long duel with experienced driver john Magro to cross the line side by side in second place by only 0.06 of a second. Once again, Calan’s first visit to a track, in this case the iconic Phillip Island circuit. Conditions were cold, wet and very changeable, however Calan immediately set the pace in practice and went on to claim his 4th Pole Position in a row for the Series. Racing was challenging in that the track condition was constantly changing, however Calan’s performance was dominant winning all 3 races by commanding margins. Having previously tested with Gilmour Racing and entered pre-season event at Queensland Raceway, finally Calan could enter an event having familiarity with the circuit and dominated from the start. In qualifying Calan claimed pole with a time of 1:04.5 which was only a tenth off the F3 lap record. For a while it appeared that this would be broken officially during racing, however strong winds which eventuated over the weekend meant this would become unlikely. Nevertheless, after some close racing in the early stages of races with former Champion Chris Gilmour, Calan once again claimed a clean sweep of 3 from 3 victories to win the round and claim the Australian F3 Title with a round to spare! In terms of outright pace, Calan has now set the fastest lap in 13 of the 17 races he has contested in the 2017 Australian F3 Premier Series, along with claiming all 6 Pole Positions. In December 2017, Calan travelled to Spain to take part in a two day test with Fortec Motorsports. Fortec is one of the leading motorsport teams in the world, competing across 6 categories including the Euroformula Open, an F3 Championship competing across Formula 1 tracks in Europe. Calan’s test was an incredible success, matching the pace of the team’s experience Romanian driver Petru Florescu in qualifying runs, and stringing together outstanding consistency in a long race run, with 10 laps in a row all within 4 tenths of a second of his quickest time for the run. As a result, Calan is now confirmed to compete with Fortec in the Euroformula OPen Winter Series commencing with another test in Barcelona mid Feb, a 2 day race meeting at Circuit Paul Ricard, France, and them concluding at the end of March back in Spain at another Formula 1 circuit, Jerez. In February 2018, Calan commenced competition with Fortec Motorsports in the Euroformula Open Winter Series, the pre-season testing and racing leading in to the Euroformula Open Championship itself. In the first event, an official 2 day test at Barcelona, Calan announced his arrival in European F3 by running multiple sessions in the top 5, and a narrow second in one session. Next was Calan’s debut international race meeting at Paul Ricard in France. Amongst 15 of the best young drivers in the world, from across 12 different nations, he exceeded all expectations by finishing in 7thplace. This was a feat made all the more remarkable given that he was the only driver to be on their first appearance at the circuit. In the final Winter Series event, a 2 day test at Jerez in Spain, Calan demonstrated his ability to adapt and learn quickly on one of the most challenging circuits in Europe. So much so that following this event, Fortec Motorsports announced the signing of Calan for the Euroformula Open Championship. In his first year of the Championship in 2018, Calan competed against many of the best young drivers in the world on many of the most famous Formula 1 circuits such as Estoril, Barcelona, Paul Ricard, Spa – Francorchamps, the Hungaroring and Silverstone. Visiting the majority of the circuits for the very first time, Calan continues to develop his natural pace and potential by qualifying inside the top 10 (of 17 drivers) in 6 of the 8 opportunities to date. In Round 3, in an enormous challenge, Calan raced at the legendary Spa – Francochamps circuit with 19 corners over nearly 8km including the incomparable corner of Eau Rouge. The only driver in the field to be racing there for the first time, Calan charged through the field to finish 7than earn his first Championship Points including a daring pass through Eau Rouge itself. At the Hungaroring for Round 4 he continued his progression and run of form to finish 6th, again on his first time to the circuit which is regarded even in Formula 1 circles as the most difficult in Europe. For Round 5 at Silverstone in the UK, after only an hours track time in practice, Calan broke in to the top 5 on both occasions for qualifying, and scored Championship points in both races over the weekend. At Monza for Round 6 of the Championship, Calan demonstrated his arrival as a contender at this level being one of the quickest drivers throughout the event. He qualified P3 and P5 and once again collected points in each race.